In landscape design terminology, the definition of plant "texture" is the perceived surface quality (regarding size and shape, not feel) of a plant part compared to that on surrounding plants. The texture of a specimen's leaves or blooms can be perceived as coarse, medium, or fine. Eye-catching combinations can occur when coarse foliage grows next to fine foliage, creating a contrast. A good landscape designer will often mix plant textures to avoid monotony; this is one of the smart ways to draw attention to and improve the appearance of a planting bed. In fact, textural contrasts can be mesmerizing. Amateurs may think of color first and foremost as a way to achieve this goal, but professionals have many other tricks up their sleeves to elevate their landscape-design work to a higher level. It has no indentations along the margin. It has a blunt shape (as opposed to being long and narrow). A tree's bark is rough. The leaves of the lamb's ear plant are soft. In landscape design lingo, however, references to plant "texture" most often reflect observations about how a plant part looks relative to others rather than to how it feels. 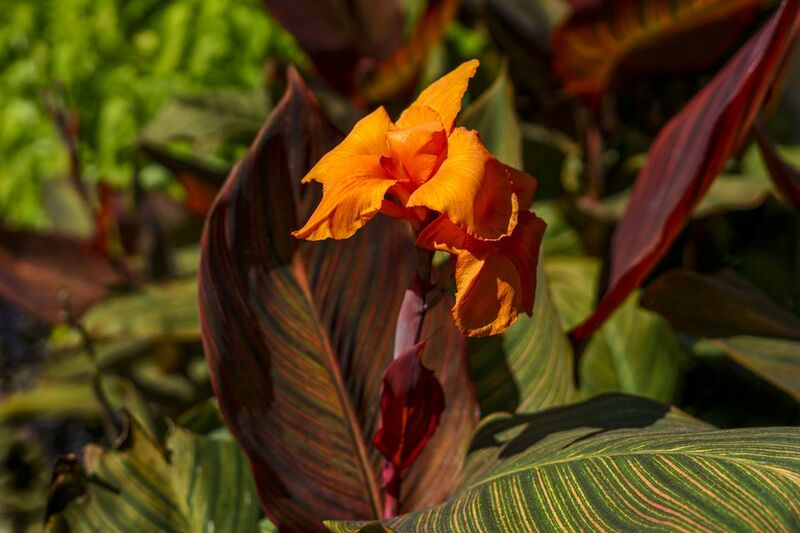 Canna lilies, such as Tropicanna canna, have very coarse foliage. Since ornamental grasses have a finer plant texture, by comparison, they would contrast well with canna lilies. Likewise, in terms of flowers, the blooms on the various types of roses (Rosa spp.) are relatively coarse. By contrast, the flowers of perennial bachelor buttons (Centaurea montana) have a fine plant texture. Silver Dust dusty miller, a silvery foliage plant, has fine leaves. It is often paired with that popular annual, the red salvia plant, which has coarser leaves. Red salvia is also a good companion for another annual, yellow French marigolds (Tagetes patula). In this case, you get not only the textural contrast between the fine foliage of the marigolds and the coarser leaves of the salvia but also a vibrant red-yellow flower combination. Another good match for annuals if you want textural contrast is flossflower (Ageratum houstonianum) with its coarseness and cosmos (Cosmos bipinnatus) with its fine leaves. Russian sage (Perovskia) is a sub-shrub (treated as a perennial) with wispy foliage that looks good against a background of plume poppies (Macleaya cordata), with their much coarser leaves, although the latter is an invasive plant in some areas (and may be too aggressive for many gardeners' tastes even in regions where it is not listed as an invasive). Incrediball hydrangea is a safer alternative. If you value fragrance, let lavender (Lavandula) do double-duty by combining it with coneflower (Echinacea). The latter's coarse foliage contrasts with the fine, fragrant leaves of the former. The previous examples are all sun plants. For shade, one possible choice is elephant ear (Colocasia esculenta), whose leaves are very coarse. Like canna, it is a tropical plant. If you would prefer a cold-hardy perennial with big leaves, grow leopard plants (Ligularia). Pair them with black mondo grass (Ophiopogon planiscapus Nigrescens) and/or border grass (Liriope spicata). Both of these shade-tolerant plants are sometimes referred to as "ornamental grasses," although they are not grasses, technically. This botanical fact notwithstanding, they share a fine texture with the true ornamental grasses and so are useful for creating contrasts.